Outdoor educational and interpretive signs, such as the ones featured in this website showcasing native fishes and the values of riparian zones (streamside forests), can serve many beneficial educational functions. 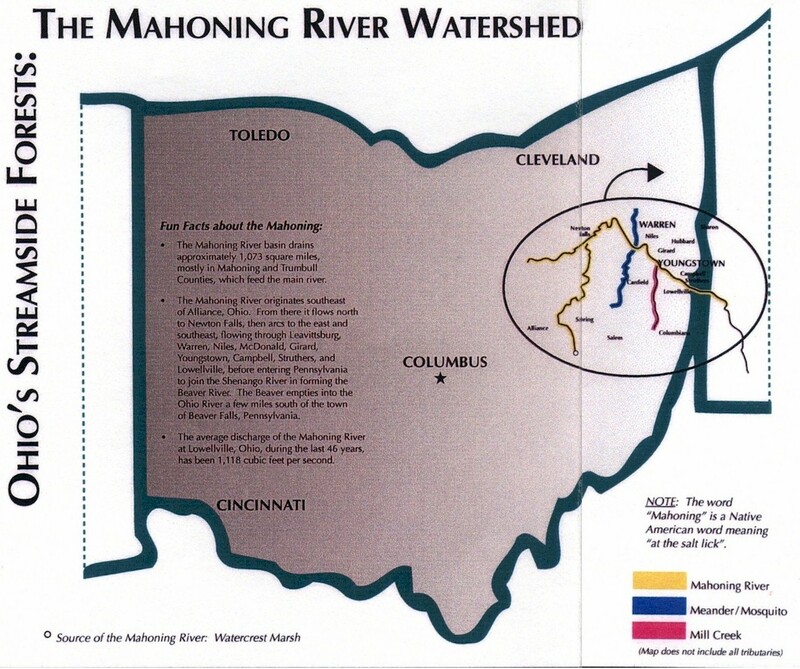 These handsome, colorful, large and informative displays can be placed along rivers, streams and on nature trails, or in nature centers in your communitys public parks, etc., where many people can stop and read them. The purpose of these signs is to enlighten people as to their local rivers animals and habitats, as well as help them appreciate the natural and important aspects of areas that have streams running through them. If a popular park near you has lush river and riparian zone habitat, but nothing to help people understand and appreciate these features and their functions, these signs can help! They will remind all who view them of the wonderful over-looked secrets of nature that lie right beneath their feet, only a stones throw away! 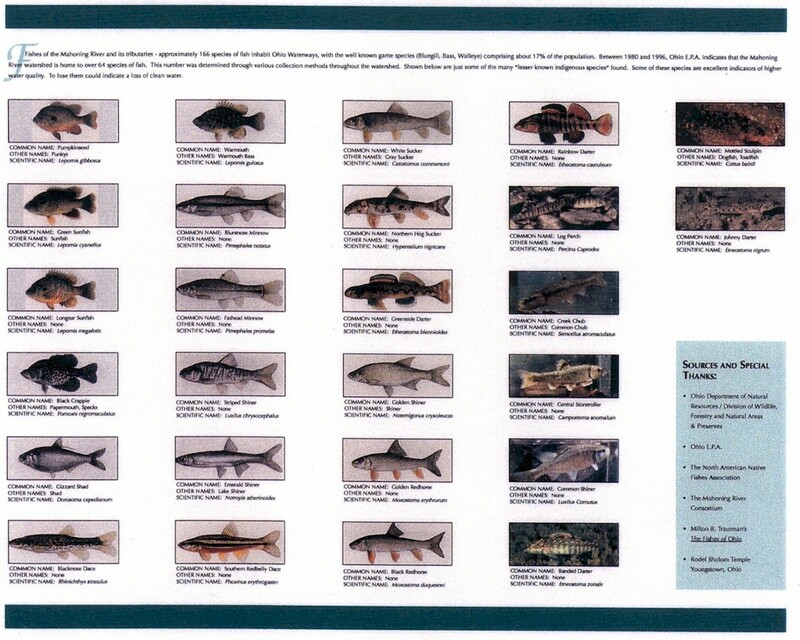 I have seen interpretive signs in such areas before, at trailheads in kiosk structures, etc., however, there has been nothing interpreting the diversity of aquatic life, namely in this case, our native non-game fishes. So this was what inspired me to start this project, and share the idea with everyone, in the hope that it will inspire you to do the same thing. In addition, I just wanted to stimulate a better respect and awareness for all local fauna. 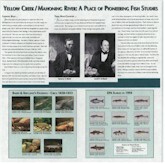 Interpretive signage displays can serve as a tool for school teachers. 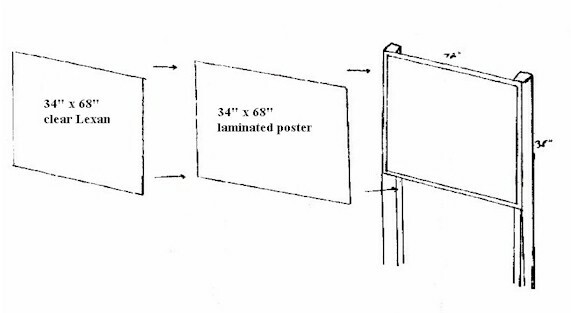 The creation of a sign makes an ideal project for the classroom. 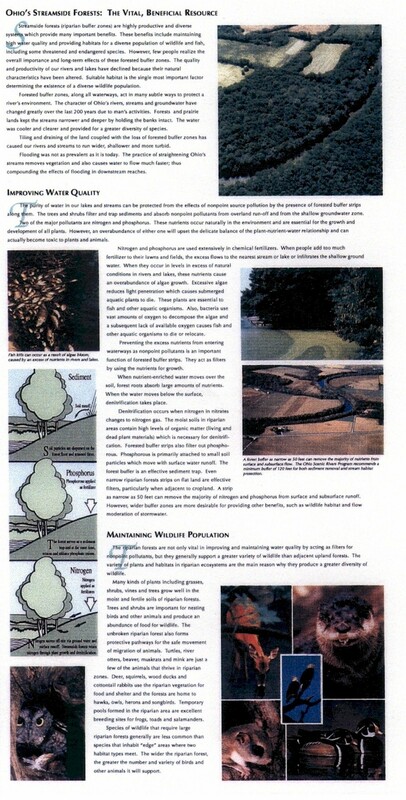 A science teacher may be teaching in a school that is close to a stream, and chances are he or she is already using that stream as a possible outdoor environmental land lab, or something similar. 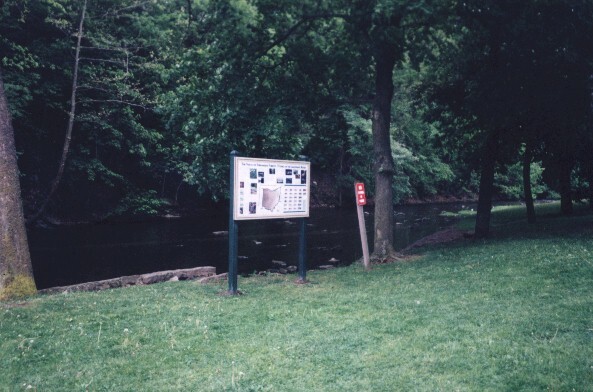 Having an interpretive sign in the area of study can serve as a reference tool for information about the river, as well as a spot where students can view actual photos and illustrations of the aquatic life they may be searching for. The display can serve as a starting point for all outdoor lessons where study groups can meet and disperse. 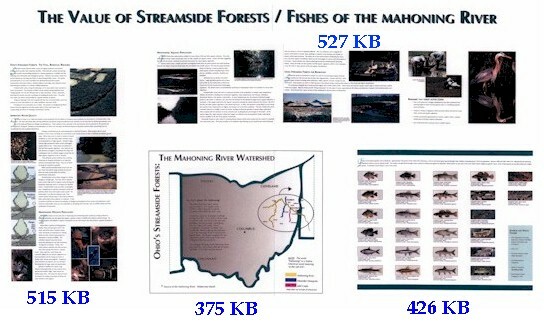 Topics on my display include information on improving water quality with streamside forests, appreciating and maintaining wildlife populations, and how healthy streamside forests play a key factor in the quality of life in a community and a healthy economy. Such an educational display is relatively easy to make, and can even be landscaped at the base, using native plants and rocks, or even a small bench, creating a new community focal point! You may use the information provided to serve as examples of what you could do in your community. You may want to get in touch with a local elected official and explain this project. They may help you a great deal, especially if it is election time! Groups that would possibly help spearhead and even fund such a project are your local Kiwanis and Rotary Clubs, Boy Scouts of America, church youth groups, state wildlife agencies, or local conservation or sportsmen clubs. 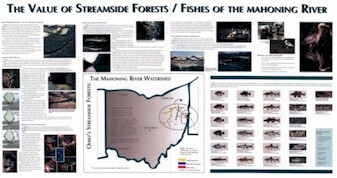 Agencies such as The Ohio Department of Natural Resources, even have small grants available to the public for this kind of project. I encourage people who are looking for an environmental educational project to consider this project, for it will show many the significance of our native fishes and their habitats, how they play very important roles in our everyday lives, and how losing them could prove costly. Please write to me if this project has served as a role model for you or your organization to do the same thing! This will assist in determining the success of this outreach! If you are NANFA member, please dont forget to list NANFA contact information on the sign! 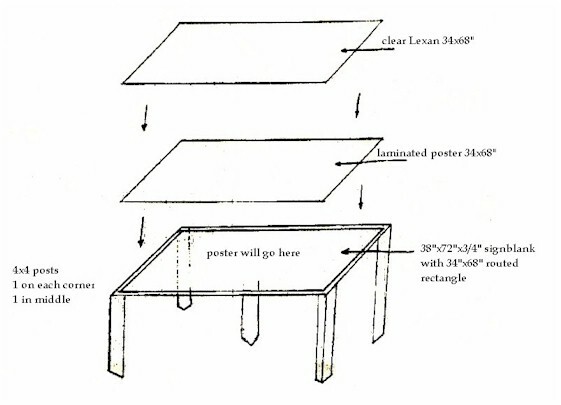 Sample graphics, text, and sign structures are available below. Should you decide to use any information on this site, please give credit to photographers, authors, printers, etc. Thanks, and good luck! 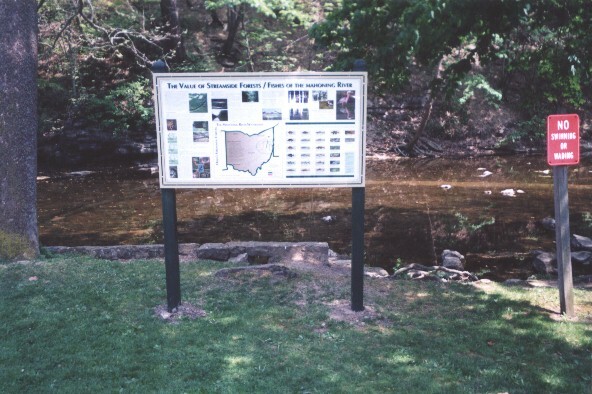 Here is a photo of the sign at use inside Beaver Creek State Park Nature Center. Note: The lumber used for the sign is "plastic lumber" made from recycled pop and detergent bottles. For information on this material, contact The Plastic Lumber Company (Akron, Ohio) at 330.762.8989. Partial funding for this project was provided through the Gerald C. Corcoran Education Grant. UPDATE! Rob recently completed another sign. 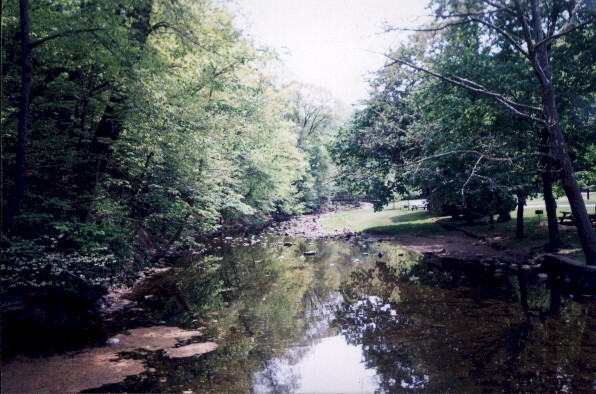 This one deals specifically with a tributary of the Mahoning River called Yellow Creek. 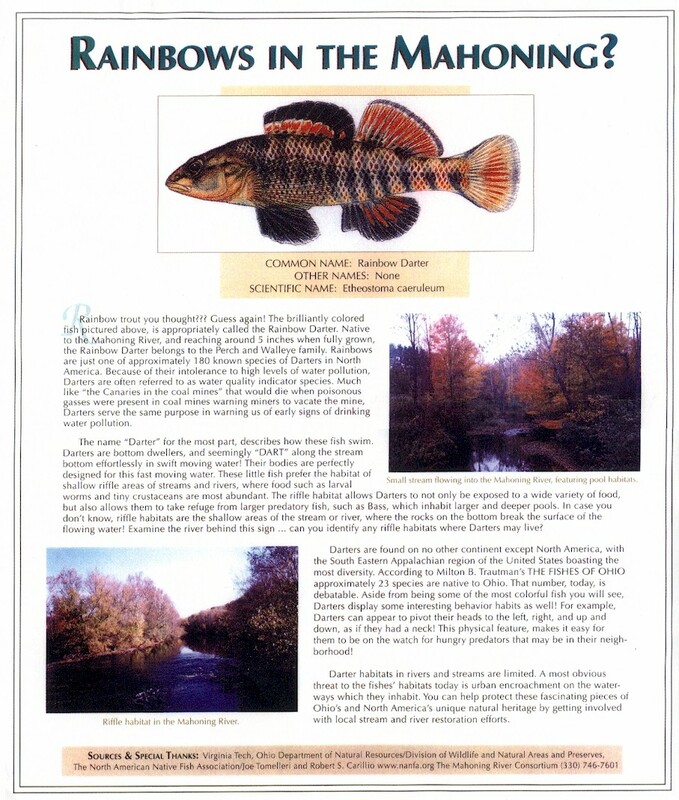 Rainbows in the Mahoning? Click HERE to view yet another sign by Rob!